This study, first published in 1994, examines an important issue, the repeal of the thirty percent withholding tax imposed by the US on interest payments to non-resident alien individuals and foreign corporations, that is emblematic of the US quest for foreign capital in the 1980s. 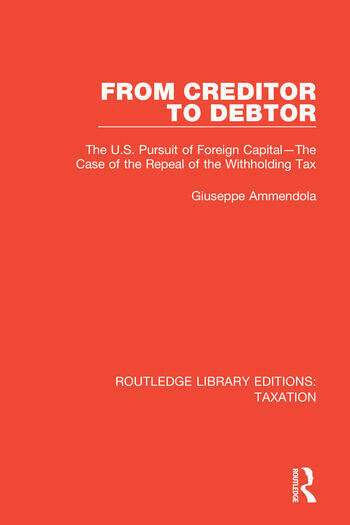 It presents an interdisciplinary and multidisciplinary analytical approach to show how important the access to foreign capital had become on the eve of the US turning into a debtor nation. Dr. Giuseppe Ammendola is an international and multilingual consultant and public speaker. He writes on international finance, trade, strategic management, and government. Dr. Ammendola teaches at New York University and has been a visiting professor and has lectured at several Italian graduate schools.